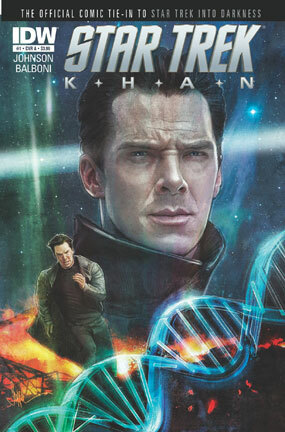 It appears that IDW Publishing will be expanding the origin story of the great villain Khan Noonien Singh with a 6 issue miniseries this October. That's good because the film Star Trek: Into Darkness gave us so little, that it needs explaining through other mediums. In fact I wonder if they'll cover the reason why in this alternate universe Khan has been genetically modified to be white. Perhaps it was Eugenics War induced trauma? "We're traveling back in time to show Khan's rise to power and give fans their first look at the legendary Eugenics Wars," says Johnson. "As the series unfolds we will see the events that led to Khan leaving Earth aboard the Botany Bay, and then jump forward to witness his awakening in the future by Admiral Marcus." There were novels already written about this, so it's not the first look at the Eugenics Wars. Sure, I sound off putting, but I've bought a bunch of these issues already, and they are mediocre at best. I was hoping they could do so much better, and honestly- there's only one issue I've thoroughly enjoyed. It was Leonard "Bones" McCoy's stand alone one-shot issue. Somehow in IDW's mess of a J.J. Abrams' Star Trek tie-in series, they managed to make a single comic book stand out.